From Tebow Time to the "Tecmo Bowl MMO"
Whatever you think of him, Tim Tebow has made a contribution—if indirect—to video games development. Last fall, as the quarterback was leading the Denver Broncos to an improbable six-game winning streak, David Murray got an idea to create a "Tecmo Tebow" image—Tebow, as an 8-bit Tecmo Super Bowl player, kneeling in the end zone. The image went on a shirt, the shirt went on sale, and all the money from that went straight into Murray's next project: a "Tecmo Bowl MMO." That's not the actual title of the game, nor is its gameplay a straight copy of the 20-year-old NES classic. But it's a good enough shorthand for what Murray and his team are out to accomplish, and it's an easily understood pitch as the project seeks backers through Kickstarter. 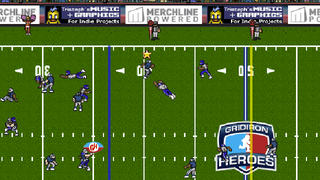 Gridiron Heroes is the game's name; it is seeking a modest $7,500 and has 34 backers so far. Murray vows the game will be built whether his team hits their Kickstarter goal or not. They'd like to get the money, of course; it would buy some licenses they need to add more features to future versions. But Murray and his two colleagues building the game are committed to completing this first version as a labor of love, if nothing else. "It's a certainty we will have something in April," Murray told Kotaku. Donating $15 or more to the project will get you into the game's beta, which is set to go live that month. "Right now we're putting in a lot of sweat equity; this money would mean being able to acquire some more software licenses for a live-playing version," Murray said. Gridiron Heroes will be a Facebook game, but before you run away groaning, hear them out. That platform is the fastest and easiest way to connect the sizeable population that would give a "sports MMO" its meaning. What Pixel Rampage (Murray's studio) intends to build first is a player management simulation, with asynchronous gameplay against other connected competitors. The play-calling window in Gridiron Heroes. Players will program in a gameplan and then watch it unfold in a play-by-play simulation. Players will develop a team of players and then program in a game plan for their upcoming contest. They'll be given an opportunity to see the makeup of the next scheduled opposing team. The game plan will be the set of plays the team intends to use to either exploit their opponent's weaknesses or shore up their own. (Some situational plays, such as third-and-long or red zone situations, will be programmable on offense and defense). Once that's set, they player will tell the game he's ready, and a result will be generated through background calculations. The player may watch the play-by-play live if he wants. There are two other, NFL-licensed management games out there: Madden Superstars on Facebook, and QuickHit NFL a free-to-play browser-based that's a lot more sophisticated in its visuals and playcalling. Murray says Gridiron Heroes' first offering will fall in between the experiences those two offer: It's more substantial than Madden NFL, in which game decision-making is very limited; but it won't take as long as a single game does in QuickHit. "This is quick, it's arcadey, it can be as much as you want it to be lifelike or NFL-like. But you're going to have some outrageous scores," Murray said. "All of the things that made Tecmo Super Bowl fun, that's in the core of it." The concept has already gotten a thumbs up from Zynga co-founder Justin Waldron. "A Tecmo Super Bowl social game?" he wrote on Facebook. "This needs to get funded." The visual style and play execution is definitely evocative of Tecmo Super Bowl. See that video at left to get a sense of it. Murray has taken a close look into what they're building and is confident that what it does wouldn't be an infringement upon what Tecmo Koei has built in the past 20 years—most recently with Tecmo Bowl Throwback in 2010. Gridiron Heroes, of course, will be free to play, with some premium boosts offered that give players access to a free agent market with better players, and extra plays. The fact Gridiron Heroes is more a management simulation than a live-action game means the "Tecmo Bowl MMO" tag may oversell the depth of its similarities to the original game—for now, anyway. Depending on how this performs, Murray and his team have ambitions of introducing live gameplay at some point. For now, they just want to build a familiarity with the game and its controls and goals. The asynchronous simulation also assures players that they will complete every game they start online; nothing will be scrapped if a connection drops or another guy quits. "There's a vast community out there that loves Tecmo Bowl and Tecmo Super Bowl," Murray said. "We're fans just like they are. I'm 29, I got it on Christmas Day in 1991. My brother and I just played the heck out of it. I'm a lifer at this point."